Chemistry students from Castle Manor Academy had the opportunity to visit town Biotech company Genzyme as part of their A-level studies last week. The students used Nuclear Magnetic Resonance Spectroscopy (NMR) to analyse a sample of sugar and learned about the work that Genzyme are doing in the development of treatments for diseases such as Cystic Fibrosis. Dr Wolstenholme-Hogg, who runs the NMR lab, discussed some advanced concepts with the students including quantum mechanics, cutting edge NMR analysis and genetic engineering. All three students are hoping to study chemical and biological sciences at university in September and the visit was a fantastic chance for students to see how the things they are learning in lessons relate to 'real life science'. A-level cChemistry is part of a broad range of science subjects, offered to students throughout the curriculum at Castle Manor. Assistant principal Matt Gill, who accompanied the students on the visit, was full of enthusiasm about it. “Today’s visit provided a fantastic opportunity for students to experience the real applications of science," he said. "Last week we had biology students visiting a lecture at Cambridge University to see the academic side of science and this week we were able to see the commercial side. 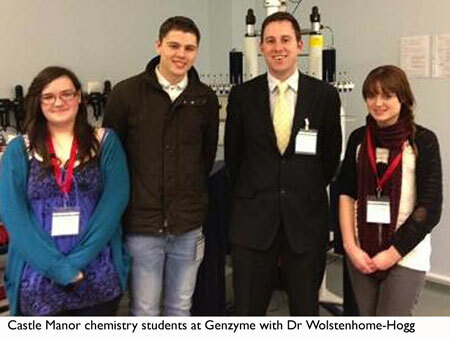 Castle Manor thanked both Genzyme and Dr Wolstenholme-Hogg for their hospitality and are looking forward to visiting again to explore some more techniques in May.